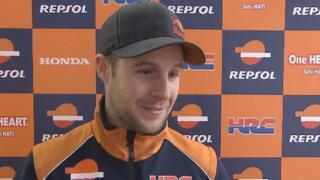 Jonathan Rea says it is a "huge relief" to sign a new deal with Honda to ride in the World Superbike Championship. The Ballyclare rider will race for the second time in MotoGP this weekend at Aragon, as a replacement for the injured Casey Stoner. Rea finished eighth in his MotoGP debut in the San Marino round at Misano earlier this month.